Welcome to Range, Washington, an inland island — a body of land surrounded by rivers on all sides — that’s half Snoquomish Indian Reservation, half small-town America, and 100% unbridled madness. Range’s mayor has been running unopposed and ruling the town for half a century, like his father and grandfather before him, and the town’s sheriff is a drunk in the early stages of alcoholic dementia, both of whom come quickly into play after a series of grisly murders takes place in the idyllic town. Not to mention, the citizens and those passing through suddenly realize that nobody can leave the city limits. [Cue The Twilight Zone music here.] Fingers point to Mort Carver as the murderer, a serial killer of brutal proportions who’s been granted asylum on the Snoquomish Reservation, which is only the start of an accelerating series of oddities to occur within Range’s boundaries into the fever pitch of its staggering conclusion. And so goes Tom Manning’s wormhole of a horror graphic novel Runoff, in all its carnivalesque glory. Published by One Peace Books in this omnibus edition, Runoff feels like what Raymond Carver or Garrison Keillor would produce if they decided to create a graphic horror novel, with some of Cormac McCarthy’s sparse prose and dark Americana violence and grit, as well as Katherine Dunn’s dark sideshow Geek Love humor thrown in for good measure. 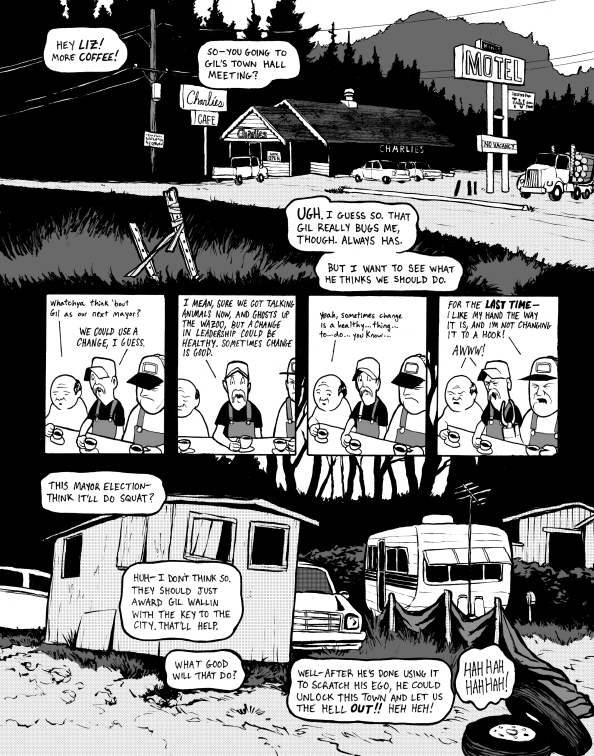 Drawing from a multiplicity of artistic vernaculars — various eras of comic book styles, horror comics like Tales From the Crypt, newspaper comic strips, photorealism, film noir, horror, Japanese anime, and even music — Manning has created a cinematic world on the page in which Picket Fences meets The X-Files and Twin Peaks, with fantastic pacing and surprising moments of laugh-out-loud levity punctuating truly bizarre, and wonderfully awful happenings. in Runoff Tom Manning boasts a fluid artistic style that flows beautifully with the context — something of Norman Rockwell on hallucinogens or Mayberry on methamphetamines — with some familiar monsters and characters in a new and freakish setting. And not only is the narrative setting off-kilter in the best ways possible, Manning has made some unique alterations to the graphic novel style canon in the form of self-restrictions: He doesn’t use thought bubbles, there is no third person narrator usually featured in square boxes that mark the passage of time or exposition, he only works in black and white, and every single corner of the graphic novel — including illustrations, lettering, repeat pages, and even black pages have been inked by his very patient hands that began creating in 1999 and finally finished in 2007. All these creative constraints Manning utilizes all work to a marvelous visual as well as narrative effect. The absence of thought bubbles and exposition force the reader’s imagination to go into overdrive. No two people will read this book the same way; everyone who reads it will experience their own version of this extraordinary narrative. In Runoff, Manning also plays with orientation, sometimes forcing you to turn the book to continue following the story, and also tinkers with different methods of relaying simultaneous events, occasionally having anywhere from three or more storylines running concurrently on a single page. He also masterfully forces us to abandon linear thinking and reading as his dialogue may sprawl in circles, spirals, clockwise, and counterclockwise, taking the reader on not just a journey into a world turning upside down, but also an adjustment of our own expectations of how a story can be told. These shifts in perspective not only in “camera” angles and panoramic vistas of the city, but how we are forced to literally read differently, contributes to the sensation that we’ve wandered into a modern cabinet of curiosities, featuring Americana in ways we’ve never seen it explored before. Manning’s storytelling is a fascinating examination of different ways to utilize space to spin a yarn. One of the most exceptional moments in the story features a two-page spread after yet another horrifying occurrence, in which every single speech bubble is empty: This is how you show everyone is talking without saying a word. Chills City. From moon demons to tesseracts, secret monster societies to talking animals, fringe government black ops and talismans, geography and magical energy, ghosts and paraphysicists, all tucked away in the little mountain town of Range, Manning has created a unique piece of fiction that can be appreciated by graphic novel aficionados as well as any avid reader, which is no small feat. He’s also managed a subtle and compassionate exploration of the dark history of colonial settlement on Native American land and the painful legacy of violence from both sides that still sees repercussions today. Relevant to today’s political clime, he also creates an unassuming social commentary on law enforcement and what sometimes appears as their pseudo-vigilante style of justice, shooting first and asking questions later. In many ways Runoff is about America itself — in direct ways such as racial tension, class tension, and the relation between man and nature on our frontier, and in more abstract ways such as the intoxicating, unexpected and volatile outcomes of forced multiplicity. The book at times celebrates Americana by generating humor, kindness, inclusion, and trust, but the same batch also creates paranoia, secrecy, tribalism, and fear. The multiplicity found in the book, the redirection of expectation and genre has an American accent, which isn’t much of a surprise since American culture is often typified as a sampling and appropriation of other cultures. Here, in this art, we still find the pioneer spirit, one that creates with a bold lawlessness, an ‘anything goes’ mentality that really excites me. It’s a spirit that invites us to look at our world, our cultures, as fertile sources for reference and inspiration. I think of myself of a practitioner of a type of art I call Gothic American Surrealism. It can be found in a variety of art of various mediums: the writings of Poe, Lovecraft, Stephen King, Cormac McCarthy. The photographs of Diane Arbus, O. Winston Link, Ralph Eugene Meatyard. The music of Brian Wilson, Warren Zevon, and DJ Shadow. The films of Alfred Hitchcock, Stanley Kubrick, Tim Burton, and the Coen Brothers. The comics of Winsor McCay, Jack Kirby, Berke Breathed, and Dan Clowes. The art of Edward Hopper, Paul McCarthy, Eric White, and John Currin. And what I find fascinating is that it not only manifests itself in a variety of media, it has a tradition of inspiring and cross-referencing itself across the media. Edward Hopper’s 1925 painting House by the Railroad was the inspiration for Hitchcock’s Bate’s Motel in1960s Psycho. Diane Arbus’ Identical Twins, Roselle, NJ 1967 was twinned itself in 1980 when we saw those twin girls haunting the halls of the Overlook Hotel in Stanley Kubrick’s The Shining…which itself is based on another practitioner of Gothic American Surrealism: Stephen King. I love that! You see David Lynch’s Eraserhead influencing Dan Clowes’ Like a Velvet Glove Cast in Iron. And a phrase uttered by The Giant in Lynch’s Twin Peaks is sampled to close DJ Shadow’s album Endtroducing. This sample Shadow chose is fitting for the tradition: ‘It’s happening again,’ the Giant says. And it is this love of sampling, of appropriation, that I find inherently and instinctually American about the way I create. Freeing myself from having to create with a single voice and instead ‘speak in tongues’ seems more natural to me. It’s not that it’s easy to do, though it does feel more honest in a strange way. While Manning does fluently speak in all these tongues, there is an undercurrent in Runoff that I feel can only be attributed to Manning and his unique vision of America, monsters, science, and the weirdness that is life in a small town with a complicated heritage. 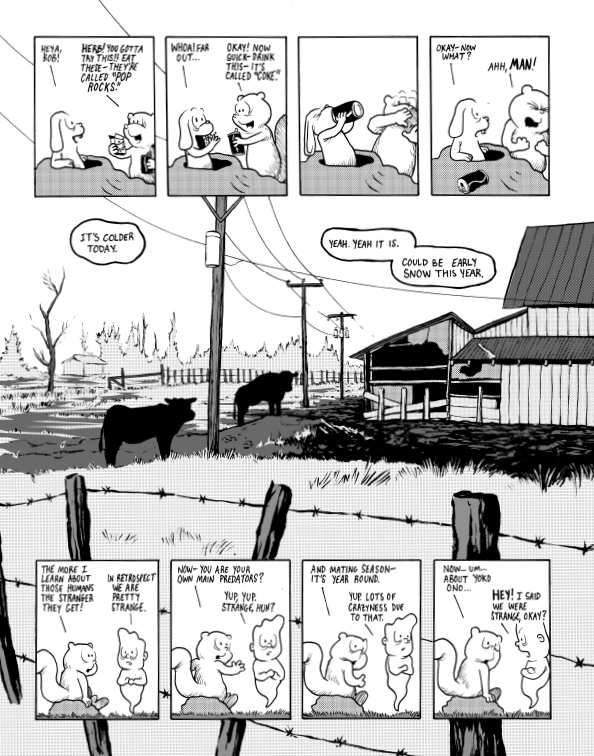 That the book is dedicated to Tom’s hometown of Enumclaw, Washington is another indicator of Manning’s personal stamp on the graphic novel genre, and one that he tells me has resonated with other people who too grew up in small-town America. For people like me who didn’t grow up in small town America, it’s a powerful insight into that kind of world, and very much akin to the stories Stephen King produces about the American northeast. 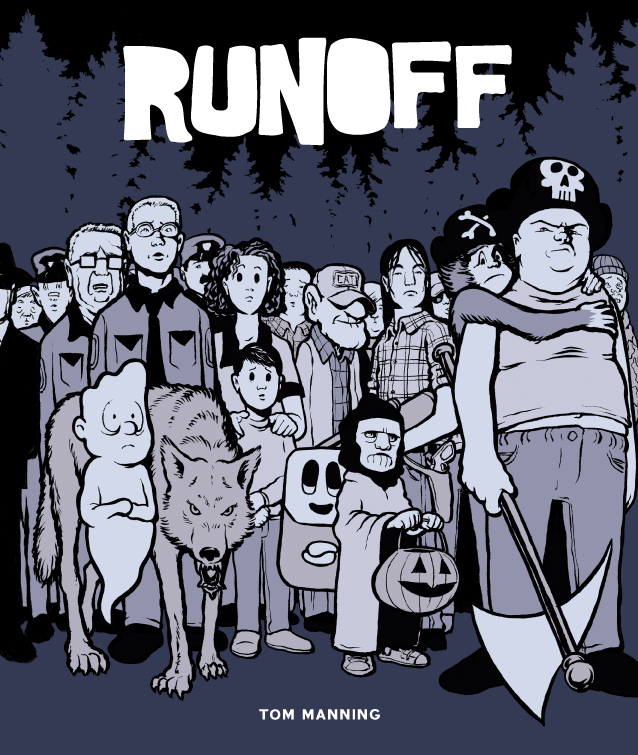 Runoff is a fantastically entertaining ode to Americana the Strange, with an everything-but-the-kitchen-sink approach to monsters and horror stories that any savvy reader will be able to appreciate and celebrate. Manning says, “I found playing genres off each other as such a powerful thing, instead of them negating or muddying the mood or story, I found it could supercharge it. And there is something about redirecting expectations within a genre that can be so powerful, so versatile. It can be extremely funny or extremely disturbing.” Or both funny AND disturbing simultaneously, as Manning has consummately engineered in his grandly weird and beautiful book called Runoff. To hear more of Tom Manning’s thoughts on comics, art, and design, check out his TYPO International Design talk here. All images courtesy of Tom Manning. This review was originally published at Huffington Post Books. From Trayvon Martin to Shaima Alawadi, walking while brown is dangerous business. Read full post. Why I cut my hair when someone I care about dies and a few other confessions about my life and American Monsters. Read full post. Reflecting on the irony of choice in America on Dr. Martin Luther King’s day. Read full post. The first step of repatriation is adjusting to the time(s). Read full post. Just because I keep moving (countries) does not mean I am moving forward. Read full post. A Zuzu’s Petals exclusive interview: A long chat with three filmmakers who are in the process of crowdfunding two horror films and a documentary. Read full post. Why are conservatives so much more likely to lean towards violence? And why hasn’t the world’s self-proclaimed champion for human rights, the USA, supported all of the pro-democracy demonstrators in Egypt? Read full post.